Debates are just one of the many things that make baseball great. What would happen if Ruth faced Koufax? How many home runs would sluggers from the past hit today? Are today’s baseballs juiced? Should steroid users be allowed into the Hall of Fame? These questions will never have a concrete answer and that is OK because baseball fans love to go back and forth with them until the fat lady sings. One of the most controversial questions that has been asked since Barry Bonds hit 73 home runs in a season is a tough one. What is the real home run record? 60? 61? 73? Another question looms over the heads of baseball fans across America as well. Can any player beat out any of these 3 controversial home run benchmarks and if so, who will it be? This article will look at both what should be considered the true single-season home run record and who is most likely to break it. So without any further procrastination, let’s look at the single-season records of Babe Ruth (60), Roger Maris (61), and Barry Bonds (73). First and foremost, Babe Ruth’s mark of 60 home runs in 1927. Ruth’s mark of 60 home runs in 1927 is incredibly impressive as Ruth was playing in the dead ball era and played just 154 games rather than 162. Despite this, Ruth played during an era of segregation, preventing him from seeing the best competition as there were plenty of people who were restricted from facing Ruth due to the color of their skin. Ruth’s mark stood for 34-years before it was broken by Roger Maris in 1961. While Ruth’s former record of 60 bombs is amazing and will never be forgotten, it is not the real single-season home run record. Up next, Barry Bonds’ record of 73 home runs in 2001. Let’s face it, there will never be another player to hit 73 home runs in a single season and that is that. What Barry Bonds did in 2001 is unprecedented, unbeatable, untouchable and should go down as the greatest accomplishment in Major League History…Right? Wrong! Barry Bonds’ 2001 home record should come with an asterisk as it is clear as day that Bonds was juicing. Despite his claims, I wouldn’t be going around buying stock in Bonds’ claims of being clean (pun intended). Saying that Barry Bonds is the true single-season home run record holder is like putting a 310 brake horsepower on your bicycle, winning the Tour De France, and saying that you were clean. Bonds’ single-season home record is not the real record in my book and should come with a big fat asterisk in the record books. Finally, the true home run record, Roger Maris’ mark of 61 home runs in 1961. 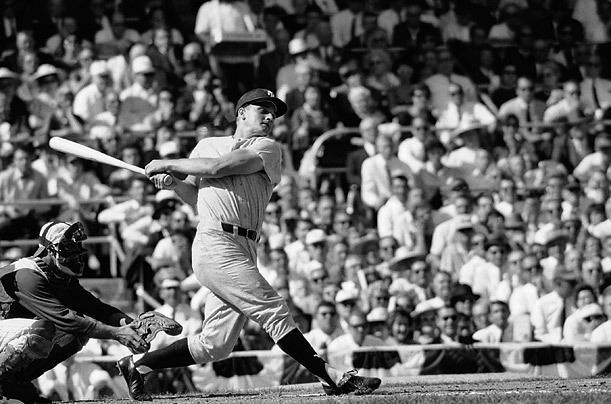 If you were to take steroid users (Bonds, McGwire and Sosa) out of the conversation, Roger Maris stands alone as the single-season home run king. Segregation was not an issue as Jackie Robinson had broken that barrier in 1947, and steroids were not even a thing. Maris’ home run record was pure and even though some may say that Maris had 7 additional games over Babe Ruth, you have to take into consideration that night games were now being played following the invention of ballpark lighting and West Coast teams made seasons longer and more difficult. 61 is the true home run record (in my opinion), regardless of what the record books say. To put it in simple terms, 61 is the true home run record. Feel free to go ballistic in the comment section, but Roger Maris’ home run record is the true record until a non-steroid user breaks it. Now, let’s take a look at some of the players in 2018 who could actually break it. At some point over the past 7-years, you have probably realized that Mike Trout is pretty good at baseball. Trout continues to amaze Major League Baseball fans every day with the incredible things that he does, but one thing that Trout has never done is hit 50 home runs in a season. The Melville Meteor, at the time of writing, has hit a Major League-leading 10 home runs and is on pace to hit 65 this year (which is amazing given that he had a pretty rough start to 2018). Mike Trout was on an incredible pace in 2017 before an injury threw a monkey wrench in everything, but now that Trout is at full health, if anyone is going to hit 62, it will most likely be Trout. Bryce Harper kicked off his contract year with a bang, leading the bigs with 8 home runs before Trout got out of a slump and got back to doing Mike Trout things once again. Harper is playing the most important season of his career and will be a free agent in the 2018-19 offseason. With Harper looking for a mind-boggling contract this offseason, he will be better than ever and that will mean a ton of home runs. 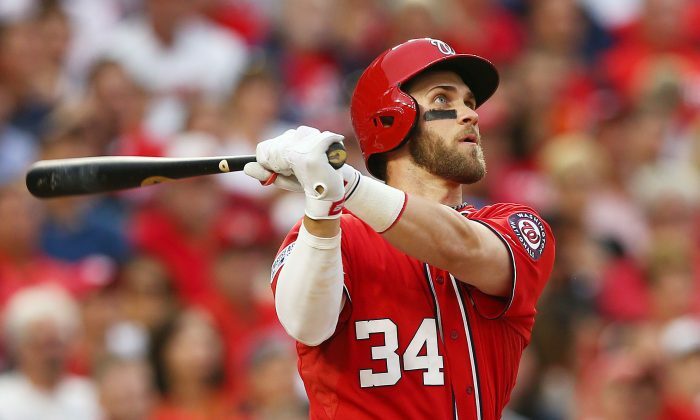 Harper is on pace for 52 home runs in 2018, but with a $400+ Million contract possibly on the horizon, Harper could possibly raise that number to 55+…or even 60+ by the end of the year. Health will also play a part, but when Harper is healthy, he is the best player in the National League. Giancarlo Stanton hit a mind-boggling 59 home runs in 2017 while playing in a pitchers ballpark in Miami. Stanton, you may have heard, was traded to the New York Yankees this offseason and will play in a hitter’s friendly ballpark. Giancarlo Stanton has gotten off to a rough start this season after hitting just 5 home runs thus far and is on pace for 35. Despite Stanton’s horrendous start that has consisted of a boatload of strikeouts, he has had worse stretches before and had gotten out of them. Stanton will get back to his normal self soon and, when that happens, the Yankees may need to put protective netting over the outfield wall in order to protect fans from Stanton’s monster blasts. Manny Machado, like Bryce Harper, has hit 8 home runs this year and will be a part of this upcoming free agent class. Machado has consistently proven that he is one of the best all-around players in baseball and he is currently on pace to hit 54 home runs. This number will obviously change as the season goes on, but if Machado continues to dominate like he has, the number 54 may be close to 60 by the end of the season. 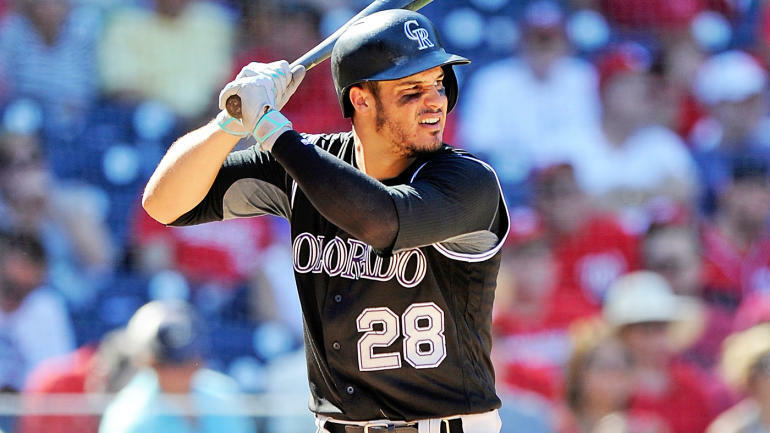 Nolan Arenado is the best third baseman in baseball and is one of the best hitters in the Major Leagues right now. Arenado also has Coors field as an advantage, making him a top candidate to hit 50+ home runs in 2018. Arenado is an extremely consistent hitter and if everything goes his way in 2018, Nolan could challenge the 60 home run mark. Aaron Judge would have hit 61+ home runs in 2017 had it not been for a massive slump that killed his shot at 61. Regardless, Judge finished 2017 with 52 home runs (a rookie record) and is a strong candidate to hit 60 bombs in 2018. Judge currently has 7 home runs and is on pace to hit 49. Despite playing in his sophomore season, Judge could hit 60+ bombs in 2018, especially with Yankee Stadium working in his favor. Cody Bellinger has gotten off to a slow start in 2018 with just 3 home runs, putting him on pace for 21 home runs this season. 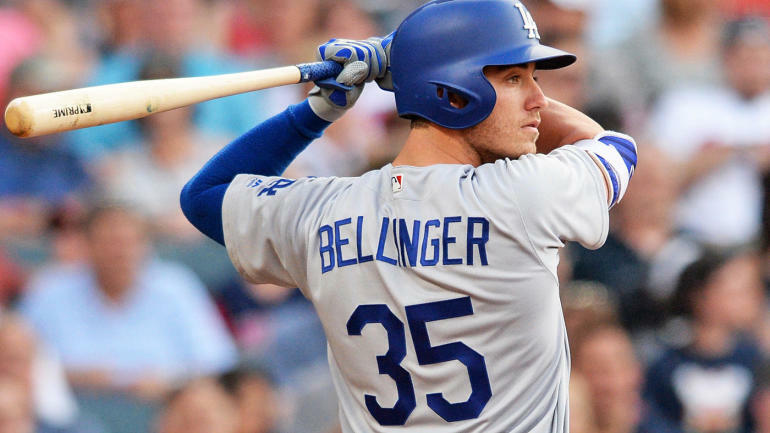 Despite this, we saw what Bellinger is capable of when he broke the National League rookie record for home runs after joining the team midseason. If Bellinger can tap into the power he displayed in 2017 for an entire season, Bellinger could challenge 60. What to expect from Joey Gallo: A ton of home runs and a ton of strikeouts. Gallo has adopted the swing big, hit big, miss big, philosophy and has become one of the most powerful hitters in baseball. Gallo has hit 7 bombs in 2018 and is on pace for 44 by the time the 2018 season comes full circle. If Gallo can cut back on strikeouts and hit more home runs, you might just see Gallo flirting with 60 in September. Since the start of the 2016 season, only Stanton has totaled more homers than Khris Davis and that is despite playing in a pitcher-friendly ballpark. Davis is definitely a long shot at 30 years old and his home ballpark will not help him in the long run, but power is power and Davis has a shot. Charlie Blackmon just signed a massive contract extension with the Colorado Rockies and has shown his gratitude to the franchise by hitting 8 home runs to begin the season. Blackmon is on pace to hit 50 home runs in 2018, but that does not take into consideration the extra home runs that Coors field will provide for him and if everything goes Blackmon’s way, he could challenge 60. Hoskins hit 18 home runs in his first 34 games in the Major Leagues in 2017 and while he will not be able to maintain such an incredible pace, Hoskins may just end up becoming the premier power hitter in the National League. Hoskins has not gotten off to that great of a start in 2018 home run-wise, but if he can capture some of what he had in 2017, he may just challenge 40-50 home runs. Didi Gregorius is off to a fantastic start in 2018 and after hitting 8 home runs to begin the year, Sir Didi is on track to hit 63 home runs. Gregorius is definitely a long shot, but Yankee Stadium will be beneficial to him in the long run, and if everything goes Gregorious’ way, he might surprise people. Do I care that Bartolo Colon is a pitcher in the American League? No! It’s Bartolo Colon case closed! In an era where home runs are abundant, 61 home runs in a season is bound to be broken at some point. Will anyone listed hit 61+ home runs in 2018? Will anyone not listed do it? It is highly unlikely, but possible nonetheless. Let me know in the comment section below. April 26, 2018 May 1, 2018 61 Home Runs, Aaron Judge, Babe Ruth, Barry Bonds, Bryce Harper, Charlie Blackmon, Cody Bellinger, Didi Gregorious, Giancarlo Stanton, Joey Gallo, Khris Davis, Manny Machado, Mike Trout, Nolan Arenado, Rhys Hoskins, Roger Maris, The Real MLB Single Season Home Run Record and Can It Be Broken in 2018? I think this season, more than any other time in recent history, weather will play a roll in how many bombs are hit. This cold weather start to baseball season lends to less HRs being hit. But a warm, dry summer will make that ball fly out.